OBJECTIVES: To evaluate the prevalence and pattern of BSF in head injury patients referred to Dr George Mukhari Academic Hospital, Gauteng, South Africa. METHODS: Patients of all ages with head injuries were considered for the study, and those who met the inclusion criteria were scanned using a 128-slice multidetector helical computed tomography (CT) machine after obtaining consent. Data were prospectively obtained over a 6-month period, interpreted on an advanced workstation by two readers and statistically analysed. RESULTS: The prevalence of BSF in this study was found to be 15.2%. The majority of patients (80.5%) were under 40 years old, with a male to female ratio of 3:1. The most common aetiology of BSF was assault, which accounted for 46% of cases. The middle cranial fossa was the most frequently fractured compartment, while the petrous bone was the most commonly fractured bone. There was a statistically significant association between head injury severity and BSF, and between the number of fracture lines and associated signs of BSF (p < 0.001). The sensitivity of clinical signs in predicting BSF was 31%, while specificity was 89.3% (p = 0.004). CONCLUSION: The prevalence and pattern of BSF found were consistent with data from previously published studies, although, dissimilarly, assault was found to be the most common aetiology in this study. The reported prevalence of BSF varies greatly in the literature. In the developed world and Asian studies, BSF has been reported to have a prevalence of 3.5% - 24%, whereas studies conducted in Nigeria suggest higher figures of 33% - 46%.4,7,12,13 The main limitation of these findings in the present study is that they are derived from Western, Asian and Nigerian populations and therefore may not necessarily be generalisable to the local South African population. For South Africa, there is limited data in the literature regarding the prevalence and pattern of BSF. It is for this reason that we decided to evaluate the prevalence and pattern of BSF in the South African context. A cross-sectional prospective and observational study was performed at Dr George Mukhari Academic Hospital (DGMAH) located in the Northwest district of Tshwane, Gauteng province, South Africa. DGMAH is a teaching hospital affiliated with the Sefako Makgatho Health Sciences University. The study included any patient with a head injury referred to the Radiology Department for a CT brain scan, including paediatric patients. Conversely, the exclusion criteria included previous head injury, recent brain surgery, pre-existing bone pathology, incomplete images and/or severe artefacts that could render the images unreadable. A total of 210 patients who met the inclusion criteria were analysed over a period of 6 months, from June to November 2016. Patients were scanned with a Philips Ingenuity Core 128-slice multidetector helical CT scan machine (Phillips, Amsterdam, the Netherlands) using a built-in head trauma protocol with 1-mm slices and a bone kernel. Images were then analysed on an IntelliSpace Portal V6.0 Philips workstation (Phillips) that offers multiplanar reconstruction and three-dimensional (3D) capabilities. Images were interpreted by the lead researcher (a radiology registrar in the third year of training at the time of the study) and a qualified general radiologist with 6 years of experience, independently of one another. BSF was diagnosed when there was a direct visualisation of a fracture line of the skull base on CT. In patients with signs such as brain contusion, intracranial haemorrhage, pneumocephalus, haemosinus or other features of intracranial or basal skull injury without direct visualisation of the fracture line, the term 'associated signs' was utilised for the purpose of our study. We did not however make a distinction between patients who had associated signs from skull base injury and those with skull vault injury as this was not the primary focus of the study. Inter-reader variability was evaluated using Kappa statistics. The data were captured on an Excel spreadsheet (Microsoft Corp., Redmond, WA, USA) and analysed using the SAS (SAS Institute, Cary, NC, USA) and Statistical Package for the Social Sciences version 25 (IBM Corp., Armonk, NY, USA) software programs. The present study received ethical clearance from the research ethics committee of the Sefako Makgatho Health Sciences University prior to commencement (ethics approval no. SMUREC/M/10/2016: PG). Consent was obtained from all the participants after the details of the study were explained to them. The patients were anonymised to protect their identity and their details were kept safe and confidential, with no divulgement to a third party under any circumstances. The study analysed a total of 210 participants. There were 159 male and 51 female patients, with a male to female ratio of 3:1. Patients' ages ranged from 1 to 81 years, with a mean of 29.61 years (standard deviation: 14.65 years) and a median (interquartile range) of 28 years (23-36 years). There were 10 patients whose ages could not be established; therefore, these individuals were not included in the age analysis. Figure 1 shows that the majority of the patients (n = 161; 80.5%) were under the age of 40 years. Of the 210 patients analysed, 32 (15.2%) had BSF confirmed on CT scan, while 178 (84.2%) had no BSF. Of the 32 patients with BSF, 18 patients had middle cranial fossa (MCF) fractures, 15 patients had anterior cranial fossa (ACF) fractures and four patients had posterior cranial fossa (PCF) fractures. Five of these patients had fractures involving a combination of cranial fossa compartments. Three patients demonstrated combined ACF and MCF fractures, whereas two patients had combined MCF and PCF fractures. There was no ACF and PCF fracture combination nor was there an involvement of all three compartments in any of the patients. Data in Table 1 reveal that the frontal sinus was the most fractured bone in the ACF, which was observed in seven patients. The same frequency of fractures was observed for a combination of different bones of the ACF. The MCF was the most frequently fractured compartment, with a total of 18 fractures recorded, as shown in Table 2. The most common isolated fractured bone without clinical signs in the MCF was squamous temporal, a finding which was observed on three occasions. Of the 18 fractures of the MCF, 12 were a combination of different bones of which nine did not show any clinical signs of BSF. The petrous bone fractures occurred in isolation in three patients and were longitudinal in all three individuals. Nine patients had a petrous bone fracture that occurred in combination with fractures of the other bones of the MCF, with an example illustrated in Figure 2. Table 3 shows the distribution of the types of petrous bone fractures. There was no violation of the otic capsule observed in any of the petrous bone fractures. 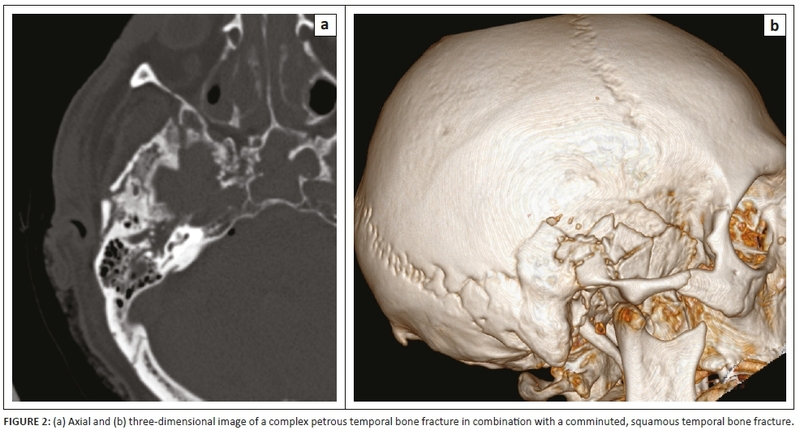 The squamous occipital bone was the most frequently fractured bone in the PCF, occurring on three occasions, and none of the four patients with PCF fractures demonstrated clinical signs. Figure 3 shows occipital condylar fracture as an example of a posterior fossa fracture with intact skull base lines. There was a total of 63 (30%) patients who demonstrated associated signs of BSF on CT brain scan, of whom 28 had a BSF on CT, while the remaining 35 did not have a BSF on CT. This implies that 87.5% (28/32) of patients who had a BSF also had associated signs as revealed by CT, whereas 80.3% (143/178) who did not have BSF also had no associated signs (p < 0.001, chi-squared test). The following associated signs were observed in an order of decreasing frequency: haemorrhagic brain contusion (33), subarachnoid haemorrhage (28), brain oedema (26), blood in the paranasal sinuses (24), blood in the mastoid air cells (21), pneumocranium (19), blood in the middle ears (14), epidural hematoma (12), subdural hematoma (10), air in the temporomandibular joint (5) and intracranial foreign body (3). Table 4 demonstrates that the majority of patients with BSF had a single fracture line, accounting for 56.3% (18/32) of the cases, followed by complex fractures of more than three fracture lines, as seen in 34% (11/32) of cases. It further shows that there was a statistically significant association between an increasing number of fracture lines and the presence of associated signs on CT scan, with an adjusted odds ratio (OR) of 3.89 (p < 0.001) and a corresponding 95% confidence interval (CI) of 1.93-7.88. Table 5 shows that assault was the most common aetiology of head injury in this study, at 46.7% (98/210), followed by motor vehicle accidents (MVAs) and pedestrian vehicle accidents (PVAs) at 22% (47/210) and 15% (32/210), respectively. The proportions of patients who had BSF because of assault, fall, MVA, and PVA were all similar at approximately 15%, despite their respective absolute values being different. Patients with gunshot injuries, motor bike accidents (MBAs), other penetrating injuries and unknown aetiology as a mechanism of their injury had limited data; therefore, their percentages were not evaluated. Simple binary logistic regression with an adjusted OR of 3.26 (p < 0.001) and a corresponding 95% CI of 1.99-5.35 demonstrated that there was a significant association between head injury severity as measured by means of Glasgow Coma Scale (GCS) and the presence of BSF on CT scan. 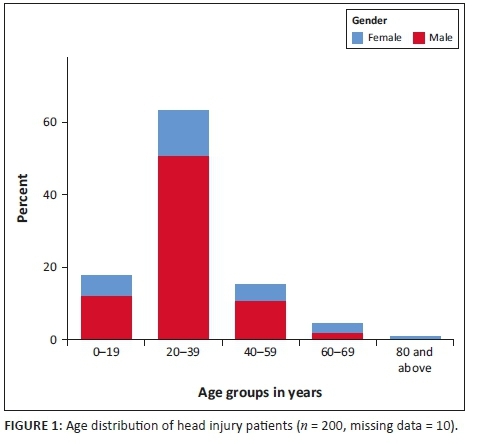 Table 5 further shows that 75% (158/210) of the patients with head injury had mild head injury with no BSF. Only 10 of 32 (31.3%) patients with BSF were positively predicted by means of clinical signs, while 159 of 178 (89.3%) patients with no BSF were identified in the absence of clinical signs (p = 0.004, Fisher's exact test). This implies that, in our study, clinical signs had a sensitivity of 31.3%, a specificity of 89.3%, a positive predictive value of 34.4% and a negative predictive value of 87.8% for BSF as compared with CT brain scan. This study notably showed that the most common single clinical sign that ACF patients presented with was a racoon eye, which was observed in 13 patients, followed by rhinorrhagia in nine patients (Table 1). Conversely, the most common clinical signs of MCF were otorrhoea and otorrhagia, each sign presenting in three patients (Table 2). There were no clinical signs observed for PCF fractures. Within the middle cranial fossa, the most common fractured bone was the petrous bone. A total of six patients demonstrated a longitudinal fracture, while four had a transverse fracture and two had a complex fracture according to the traditional radiographic classification system based on fracture orientation.21 It should be noted, however, that this classification system has been criticised in the literature for its inability to predict clinical sequelae. The preferred newer classification system is otic capsule violating versus sparing of the otic capsule because of its clinical relavance.9,17,21 It was also found that 75% (9/12) of patients with petrous bone fractures also had fractures of other bones of the skull base. This suggests that, in a patient with a petrous bone fracture after a head injury, the radiologist interpreting the CT brain scan should actively look for fractures of other bones of the skull base. Of the five patients who had BSF involving combinations of skull base compartments, three had a mild head injury and two had a severe head injury as determined based on GCS with variable aetiologies. This suggests that BSF involving a combination of skull base compartments might have no direct relationship with the severity of head injury. There was a statistically significant association between BSF and associated signs, with 87.5% (28/32) of patients with BSF having associated signs on CT scan (p < 0.001, chi-squared test). Thus, in patients who have associated signs on CT scan following a head injury, a fracture line should be sought so that the patient can receive the appropriate intervention(s). Thirty-five of 63 patients with associated signs on CT did not have BSF. This rate can be attributed to the wider inclusion of associated signs, such as contusions and subarachnoid haemorrhages. It was also demonstrated that 56% (18/32) of the included patients with BSF had a single fracture line, while 34.4% (11/32) had more than three fracture lines. A statistically significant association between the number of fracture lines and associated signs on CT scan meant that patients with more fracture lines were more likely to show associated signs on CT scans (adjusted OR: 3.89, 95% CI: 1.93-7.88; p < 0.001). It is therefore very important to note that, if a patient has multiple fracture lines on a CT brain scan following a head injury, associated signs should be sought and managed accordingly in order to prevent potential complications. Some of the limitations of our study include the fact that it was a purely epidemiological study that was performed over a short period of time and as such, the study sample might not be a true reflection of the South African population given its relatively small size and restricted geographic location. In addition, our study did not take the inclusion and exclusion criteria of the Canadian CT head injury rules into consideration. The findings of the study showed a prevalence of BSF of 15.2%, which is consistent with other percentages reported in the developed world and Asian studies. Our predominance of young male patients, mild head injuries, middle cranial fossa fractures and frequent involvement of the petrous bone are all findings consistent with those of previous studies. Contrary to previous studies, however, assault was the most common aetiology in the present study, reflecting the violent nature of our society. This finding appeals to law enforcement agencies to better ensure the safety and security of our citizens at all times. The strong association between clinical assessment of head injury severity and BSF on CT scan implies that, in the absence of CT, patients' referral to well-resourced centres should be expedited. In addition, radiologists should be vigilant regarding associated signs, such as intracranial bleeding in the presence of multiple fracture lines, when interpreting CT brain scans of head injury patients. It is recommended that similar studies should be conducted with much larger sample sizes and at other geographic locations in South Africa in order to obtain a much better reflection of the prevalence, pattern and aetiology of BSF in the country. The authors thank Prof. H.S. Schoeman for his assistance with statistical analysis and Prof. M.E. Kisansa (Head of Radiology Department at DGMAH) for her academic and logistical support. N.S.M. was the primary researcher and wrote the manuscript. C.M. made a huge contribution towards conception and design of the project, as well as critically revising the project for intellectual content. A.D. played a major role in the data analysis, as well as critical revision and approval of the final version of the manuscript.